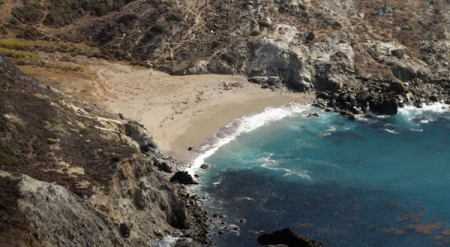 Cottonwood Beach, Santa Catalina Island is a small beach on the southwestern side of Santa Catalina Island. It’s not easy to get to, and some visit it as a side-trip during a stay at the nearby Little Harbor Campground or as a side-trip of a backpacking trip along the Trans Catalina Trail. Cottonwood Beach has a creek that pools up behind it and sometimes flows through it, leaving less sand exposed to enjoy. Swimming is not advised because a rip current could exist in this cove. This page was last edited on 19 November 2016, at 12:04.